How Can Non-Traditional Students Benefit From Online Degree Programs? Non-traditional students can be defined as those students who cannot fit a traditional class load into their schedules, and those who do not personify the role of the traditional college student. The National Center for Education Statistics states that there is no steadfast definition of the non-traditional student, but this organization acknowledges that age and part-time student status are common considerations. 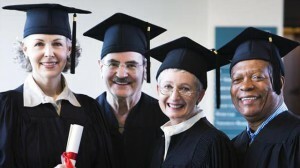 Online degree programs can be very beneficial for the non-traditional student. For students who have family and job responsibilities in addition to school, online education can solve many issues. The student can enroll for part-time status, and can often proceed through an online program at his own pace. Students can take one or two classes to see if they can incorporate higher education into their existing schedules. Working adults who would not be able to attend a brick and mortar college can take advantage of online programs to further their education and pursue degrees that will ultimately enhance their standard of living. Even students who are of traditional college age may benefit from part-time online classes before committing to a degree program. Online classes enable the student to explore potential majors and fields of study without the financial and time commitment of full-time status. Students can take a few classes in a particular discipline to find out if deep study in the topic appeals to them. If and when the student commits to a traditional program, he will have some idea of the nature of the discipline and the work that will be required of him. For older students, transportation availability and mobility may be additional concerns. Senior citizens who may have difficulty driving to a campus for lectures can benefit from learning and interaction that an online program offers. They can take classes virtually without the need for driving or obtaining transportation to a campus. One group of non-traditional students that can benefit greatly from online degree programs includes individuals with limited mobility. For students who cannot maneuver a traditional college campus due to physical limitations, online classes can open up a whole new world. When mobility is no longer an issue, the student can focus on learning and interacting with professors and other students instead of spending time getting where they need to be. Online degree programs offer a way for non-traditional students to attend lectures, labs and seminars and pursue their post-secondary degree over the Internet. Online education affords non-traditional students the opportunities to interact with the instructor and fellow students without being on campus in person. Online programs make college accessible to those who may not be able or willing to pursue a traditional, full-time college education.